Until relatively recently, insurance coverage for behavioral health has had more restrictions and limitations than coverage for medical/surgical care. Moreover, behavioral health coverage has often been more restricted in individual and small group private plans than in large group employer-sponsored insurance plans. Recently, parity protections were extended to individual and small group plans that offer coverage for behavioral health treatment to have terms of coverage that are no more restrictive than for medical/surgical treatment. 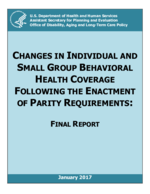 For this report, we assessed the degree to which behavioral health coverage and medical/surgical coverage in individual and small group plans changed after federal parity requirements in coverage took effect in 2014. The results focus on changes in scope of coverage (what conditions and services are covered) and level of coverage (quantitative restrictions, such as the co-payment and limits on visits). The findings suggest that parity legislation may have had the intended effect.